A compact PLC based in Open Source Hardware technology. With different Input/Outputs Units. Modular PLC This is the first equipment based on the Arduino technology designed for a professional use. This PLC has 21I/Os. It also contains several communication ports which provide more flexibility and control. The M-DUINO family offers the possibility to expand up to 127 modules through I2C, which means that you can have until 7100 Inputs / Outputs in Master-Slave connections, additionally to sensors, etc… Programming Software This PLC can be programmed using the Arduino IDE platform. See the Documentation menu below to download the software for free. Instantantaneous connection and coding. The PLC M-DUINO is programmed through the USB ports. 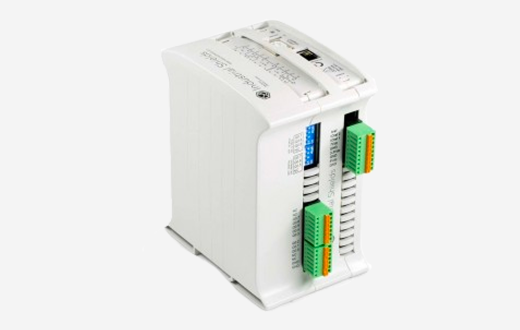 This PLC can also be programed through Ethernet port remotely. This offers and immediate access to program, mantain and control. Also you can continuously monitor the status for all the variables, inputs, outputs, etc. It is compatible with the Arbosx and the Touchberry Pi with instantaneous connection. (6x) Analog (0-10Vdc) / Digital (5-24Vdc) configurable by software. (3 of which) Analog (0-10Vdc) configurable by switch. – (1x) USB port (type B). – (1x) HALF/FULL Duplex RS-485 port. µSD Socket (using SPI port, chip select D53 pin).